Dropped knit stitch. (c) Sarah White licensed to About.com, Inc. The first step in fixing a dropped stitch is noticing that you have a problem. Here you can see the dropped stitch between the seventh and ninth stitches from the left side of the picture. Knit to the dropped stitch. (c) Sarah White licensed to About.com, Inc. In order to fix the dropped stitch, you first have to work your way over to the stitch. Just knit all the stitches up to the spot where your dropped stitch should be sitting on the needle. Use your crochet hook to pick up the stitch. (c) Sarah White licensed to About.com, Inc. 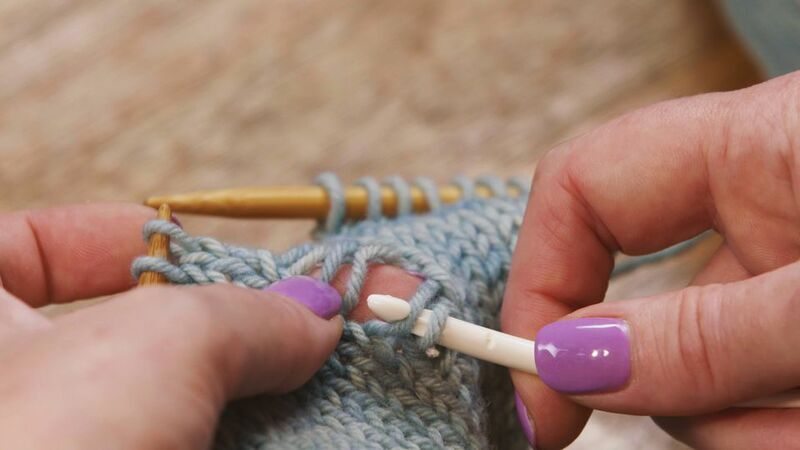 Using a crochet hook that will easily hook the yarn you are working with, slide the crochet hook into the dropped stitch from front to back. Then grab the loose horizontal piece of yarn closest to the loop, grabbing it from behind and pulling it through the loop of the stitch. Continue to pick up the stitch. (c) Sarah White licensed to About.com, Inc. If your stitch has slipped down more than one row, continue working in the same manner to get back to the row you were knitting before you stopped to fix the dropped stitch. When you're back to the top, just slip the loop back onto the right-hand needle and knit the stitch. Then finish knitting the row as normal.